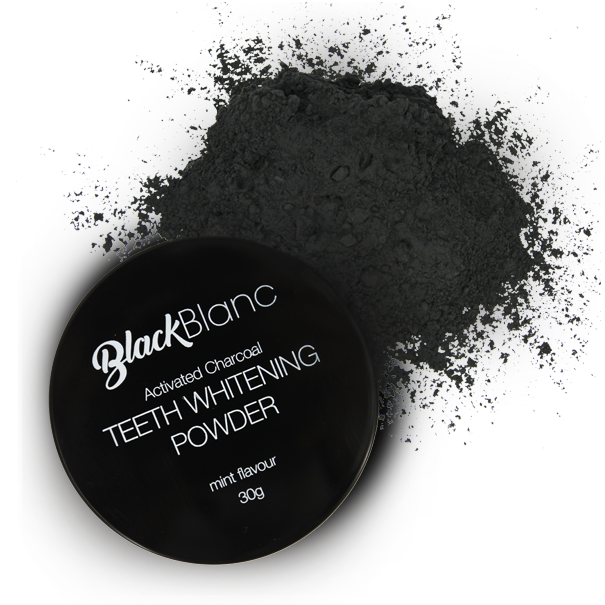 BlackBlanc Activated charcoal tooth powder naturally cleans, polishes, and whitens your teeth, while strengthening gums and removing toxins and bad breath. Activated charcoal is formed when common charcoal is heated in the presence of a gas that causes the charcoal to develop lots of pores. This porous texture has a negative electrical charge, which causes it to attract positively charged molecules such as toxins and gases. These pores are good at trapping chemicals and preventing their absorption. Activated charcoal whitens teeth by absorbing plaque and other teeth-staining compounds. The antibacterial and anti-fungal properties of activated charcoal help to clean and purify teeth and gums, removing and reducing plaque build up and odour-causing bacteria. With 6% Hydrogen Peroxide Whitening Gel and a powerful 6-bulb LED Mouth Light, the WhiteBlanc Light Enhanced Teeth Whitening Kit helps remove the stains caused by coffee, smoking, food, wine, soda, tea and more. The molecules in your teeth are given their colour by something called a chromophore, with most stain chromophores being yellow. Applying hydrogen peroxide breaks double carbon bonds within the chromophore, and when this happens the chromophore appears colourless. Here’s where the light comes in, because yellow and blue are opposite on the colour spectrum, yellow absorbs blue. When the yellow stain chromophore absorbs the blue light of the LED, it energises electrons, which can make the carbon bond easier to break down than using Hydrogen Peroxide alone. This means whitening effects happen faster and more effectively. Are you looking for a quick way to whiten your precious teeth? Looking for something that is going to do more than your standard whitening toothpaste? Finshed using the WhiteBlanc Light Activated Whitening Kit and looking for something that will top up your white smile on-the-go? The WhiteBlanc Teeth Whitening Pen is the solution! On occasion, contact of Hydrogen Peroxide with the tissues in and around the mouth, such as the lips and gums, can temporarily cause irritation. BlancBalm Nourishing Lip Balm contains Vitamin E (Tacopheryl), an ingredient that directly regulates and degrades the strength of hydrogen peroxide, therefore helping to prevent drying or harm to the lips during and after whitening. BlancBalm is a nourishing lip balm that is enriched with all natural ingredients that soothe, soften, and moisten lips. Apply BlancBalm Lip Balm before or after whitening your teeth, or use daily as needed.